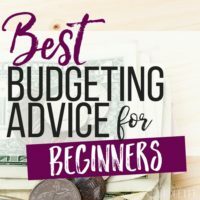 How much time have YOU spent trying to figure out your budget? Does cutting out yet another thing seem impossible? I totally get it. Saving money isn’t always easy, you guys. Great news! 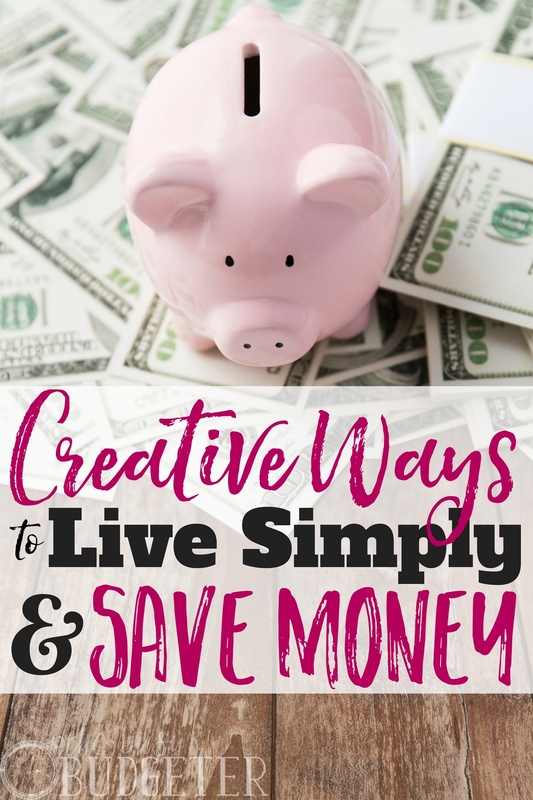 There are a bunch of creative ways to save money AND you can even save without sacrifice! Yup, these ideas don’t even involve “giving up” much of anything! Instead, think of it more like swapping out, setting limits, and learning to stretch some things you already have. I’m here to tell you: little things add up! Even better, all these little ways you find to save are pretty painless, simple and easy. Here’s how to save successfully: it’s best to start with just one or two things you can easily tackle today because I don’t want you to feel overwhelmed or defeated. Baby steps, people. 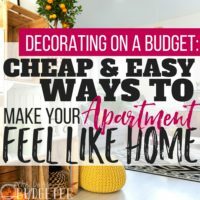 Because seriously, when you begin trying to save money and cut back, it can feel like you’re nickel-and-diming EVERYTHING. There’s a lot to keep track of. If you’re a saving newbie, you probably feel like it’s hard to imagine how you’ll get to your target savings amount. It’s also easy to feel guilty or beat yourself up about what you’ve spent in the past. I want you to start fresh today! Stop beating yourself up. Look at this as a new opportunity to make some painless changes and see some real progress on your saving goals. These creative ways to save money are things you can do right now. They’re tested. I’ve tried them all, and I’m here to tell you they WORK (and don’t hurt at all). In fact, we were able to reduce our spending by about $23,000 in a year, just by using these methods. Are you ready to start saving money (without too much sacrifice)? One of the most practical ways to save money I found was to switch out my beloved Pantene shampoo for Suave Rosemary Mint. This saved me a few dollars a month and my new shampoo smelled absolutely amazing, felt tingly and luxurious, and wasn’t a sacrifice at all. If you’re a “salon” shampoo fan, this might seem like a tall order, but I promise—your hair will be just fine with cheaper shampoo. Look for other areas of your beauty routine you can swap out. For example, if you usually shop at Sephora for makeup, try looking at Target or Walgreens instead. Sacrificing a $20 blush for a $3 E.L.F. brand might seem like a big deal, but once you use it, you won’t even notice a difference. Similar to switching up your beauty routine, you can find creative ways to save on healthy living products as well. First of all, we saved a bunch when we switched to getting mail-order prescriptions over going into the pharmacy. Not only is it convenient, but also it’s cheaper. When you buy health products, I know you might feel attached to “brand name” items. Guess what? Generic and store brands HAVE to contain the SAME active ingredients as their branded counterparts. So, buying Wal-profen over Advil will still cure your headache and save you money! Always look for the cheaper store brand and rest easy knowing it’s the same thing as the product next to it with the fancy brand name. Again, this might be one of those areas that seems like a challenge at first, but gym memberships can be super expensive! Not only that, but they’re an expensive source of guilt if you don’t use them regularly enough to justify the cost. Now for some, the cost can be motivating. (After all, you want to get your money’s worth.) But if you’re one of those people who doesn’t actually get to the gym as often as you’d hoped…it’s time to dump your gym. Unfortunately, just paying for the gym with the intention of going doesn’t really result in improved fitness—don’t we all wish! We started using our community association’s pool and track for FREE. They had some gym equipment too, so we could do our workouts right in our neighborhood without a costly gym membership. And hey, for you, maybe it’s just a matter of restructuring how you pay. Even if you pay for a weekly $10 class over a $60 monthly gym membership, you’re saving money. First of all, we became cord cutters and saved over $40 a month simply by using a Roku, our Internet connection, and a Hulu membership. If you have Amazon Prime or Netflix, you can still access a ton of shows. Or try Sling TV, which gives you à la carte cable channel choices. Second of all, when it comes to videogames, we look for games that have a great deal of play and longevity, rather than buying every new game on the market. Often, my husband will play a new game with a friend or borrow a game to try it out before buying. He always reads reviews and really researches each game before buying it. When he does find something he really wants, he buys it used. Eating at home all the time and planning your meals can be a lot to tackle all at once. But PLEASE don’t skip this section! You can totally start small with easy swaps you can do to change up your meal routine. Take lunches, for example. If you make your lunch at home 4 or 5 days a week, you can save at least $40/week for each person in your household. Even if you spend $20 on supplies to make cheap and easy lunches or microwavable Lean Cuisines to take with you, you’ll still come out ahead of what you’d spend in a restaurant or even at a grab-and-go place. Keep your dinner routine the same to start, and just try to take your lunch to work most days. As that starts to feel easier, you can add to it. Try cutting out a few restaurant nights per week and eating dinner at home more often. If you already eat at home most nights, plan your meals to stretch your budget. Make meals ahead, shop sales, and use recipes that stretch (like recipes using meat as an “accent” rather than a main course). Whenever we need something, we first check Craigslist (if it’s a big item) or our local Goodwill. Now yes, I still buy many things at stores, BUT I’ve been really pleasantly surprised by the items I’ve found used, but in like-new condition. I’ve found brand-name jeans, appliances in the box, tools and equipment for our yard, furniture and more—all on Craigslist. Another option is eBay, where you can even sometimes find what you're looking for brand new and in great condition for way cheaper than retail value. Another alternative is to borrow items when you can’t buy them—especially if it’s just for a temporary use. We love our local library, so I rarely (if ever) buy books anymore. I also check out CDs (yes, they still have CDs at the library) and movies. If you need something for a special occasion (like snow pants for a ski trip but you live in Florida, or red shoes for a wedding that you’ll wear once), try asking friends to see if anyone has something you can borrow. We limit the number of toys our kids have and the number they can have out to play with at one time. It may sound challenging, but I’ve found they really appreciate things more when they’re more discerning about what they have and what they’re playing with. We often prefer experiences over stuff. Similarly, when we think of things to do as a family (or on date nights), we try to come up with less expensive activities. This might mean checking out our local free music festival in the park, throwing a pajama and movie party at home, or doing something else that doesn’t involve expensive tickets or shopping when we get there. But guess what? You can give meaningful, awesome gifts that are inexpensive and even BETTER than big store-bought gifts. We set a $10 limit for our extended family Christmas. (It sounds nuts, but it was really fun and turned out great.) I also love to give gift baskets of items I curate that might be small, inexpensive or items I even have on hand already. I’ve also found that photo gifts are deeply appreciated and meaningful (and rarely very expensive). We’ve all heard the “legend” of the woman who reduced all her bills by half just by calling her utilities and negotiating. You know what? It’s NOT a legend! If you call, you CAN often get better rates on your credit cards, your utilities and your phone—and you can even refinance your mortgage at a lower rate. Not a fan of negotiating? Hire a service like BillCutterz to negotiate bills for you. (Yea, it’s a thing!) All you do is send them your most recent bills, then they’ll make the calls and see what they can do. The best part? You don’t pay them unless they negotiate a cheaper rate. They keep 50% of the savings (but even so, you’re still saving a bunch, so it’s totally win-win). So you want to buy or do something. Maybe there’s a restaurant you want to check out or maybe you want to go out with friends or maybe you even have a vacation planned. It’s not about saying “no” (life’s too short)—it’s about finding creative ways to save! Before I plan to go out, I check out Groupon. I look at eBates and Swagbucks before I make a purchase, and of course, I always search for coupon codes. If you’re going to spend the money anyway, there’s no reason not to try to save as much as possible, and it’s pretty rare to pay full price for anything when there are so many savings options. The key to saving money is to flip your mindset—rather than buying BECAUSE you have the coupon code or because you see the special offer, instead, look for the offer that matches what you want to do. Save without sacrifice. You don’t have to give up what you want, need or have to have—just look for creative ways to save money in each area. Maybe it sounds crazy, but I like to look at it as a fun challenge. Whenever I’m about to do something or when I need something, I always try to think of ways I can either find a creative solution or save a little money. So try these painless ways to save! 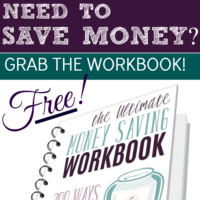 If you’re looking for even more ideas, check out this Ultimate Money Saving Workbook. (It’s free!) And hey, in the comments, let me know what ways you’ve found to save without sacrifice! One of the ways I save money without sacrifice is by analyzing what truly gives me pleasure. I have a large family with 7 kids. Going out to eat is crazy expensive, and not fun with little ones! Eating at home with my own glass of wine, 3 buck chuck from ALDI, is far more fun. I spend a little extra buying frozen veggies, pre-chopped, and bagged salads to get a meal on the table faster, but it’s WAY cheaper than eating out. Ditto for movies. We can easily drop a Benjamin on a movie, and 2/3 of the time, I’m disappointed by it anyway. We make better popcorn at home with a free library DVD or a cheap Amazon rental. In our experience there is little relationship between the expense and the fun. Hiking, biking, walking somewhere pretty, a cup of coffee and cookie at a coffee shop – these are free or cheap and give us a bigger happiness boost than more expensive fun activities. So true 🙂 Thank you for sharing! I agree 100%. I stopped shopping at Walmart for that exact reason. Now I keep a list of items I get cheaper from Walmart than Amazon and order online when I reach the free shipping limit. 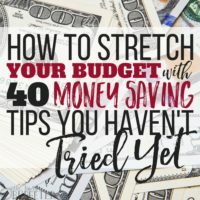 It’s amazing to think that there are so many ways you can save some money without really feeling the sting of it. TV, for example, was a huge savings for us. We cancelled our satellite TV package almost two years ago, and we still don’t miss it! Meals are probably the thing we struggle with the most. But we just ordered some meal-prep containers and are committing to cutting down on our eating out even more than now. I’m so excited to see how much money we’ll be saving soon! I love that you mentioned purchasing generic brands of medications as a way to save money. Many people don’t realize the generic versions contain the same active ingredients as the more expensive brand-name versions. Thank you for this post, it has a lot of good and easy to implement suggestions. I’m personally a fan of negotiating costs. In my experience, it’s one of the areas where you can save big. Just last week I called and negotiated with our car insurance company. I didn’t get them to cut the cost in half as the lady in the “myth”, but I did manage to get a reduction of about 9% of total cost. And it was a rather significant amount of money too. All that for the effort of a five-minute phone call and about 20 minutes research to compare prices online before the call. You mention cutting the TV-cord too, which is a great saving too. We haven’t had TV as such in a long time ourselves but use streaming services that, as you say, Rosemarie, runs a much lower cost. I get amazed and shocked about how much the companies that provide TV services actually charge. Number 10 resonates with me. I used to get into so much trouble by using coupons because I thought because I had “clipped it” I had to use it. Now, I decide what I am going to buy or where I am going and search for coupons I can use. Life changing! Thanks for the great tips! I’ve recently started doing more online shopping. I save time by getting it delivered, and I’m not tempted to buy all the cute stuff at Target (that I don’t need).